Coffee is not only the favourite drink of the Germans, but rather after crude oil, it is the second most important commodity for global trade, exported by developing countries. 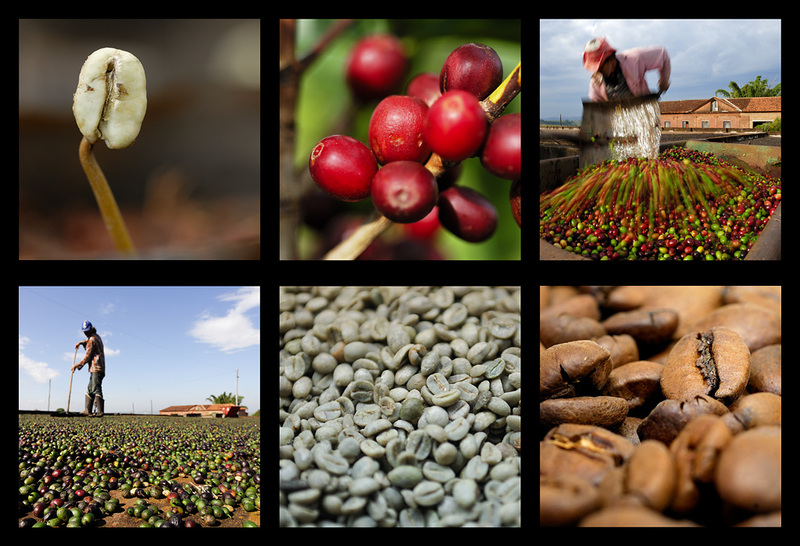 The largest coffee producing country is Brazil, which contributes 30% of the global production; followed by Vietnam, Indonesia, Columbia, Mexico, India and Ethiopia. The principle consumers are USA, Germany, France, Japan and Italy. In virtually every Espresso drunk in these countries, there is some Brazilian coffee in it. Even though the Finnish alone lead the worldwide coffee consumption with 3.6 cups per day per head, Germany is still the world champion in export of refined coffee – and the Hamburg seaport is the biggest terminal globally, for raw coffee. The Brazilians are above all amazed by this, as coffee is grown absolutely nowhere in Germany. 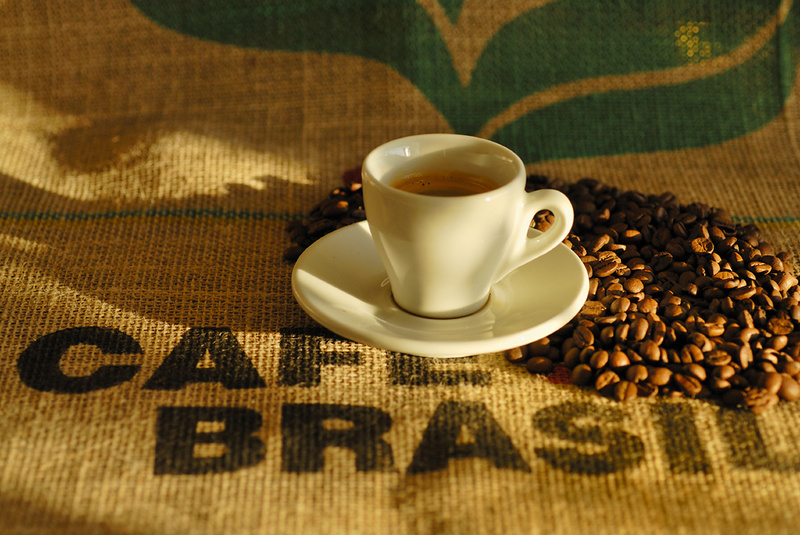 Brazil is not only about Carnival, Samba and Futebol, but also primarily about: Coffee! No other resource characterizes this country as much as this. Since the legendary-amorous introduction of coffee in Brazil in 1727, it has encouraged slavery and migration; it has bestowed immeasurable wealth on the country, but also caused several severe economic crises. It dominated agriculture and allowed cities to literally flourish, it modernized the transportation and till today provides many jobs. In Brazil, the cafezinho, the small, sweet and strong coffee is ubiquitous – at home, in the office, in the café. It is however, not only a luxury product, but also above all, a welcome greeting, an invitation to a conversation, a clear sign of hospitality. For all these reasons, I have considered the coffee production in Brazil in more precise detail. I could do this at the Fazenda Boa Vista, in the small town of Tambaú in the outbacks of São Paulo at the coffee planter Paulo Marcio Villela, where I was accepted just like a new family member. 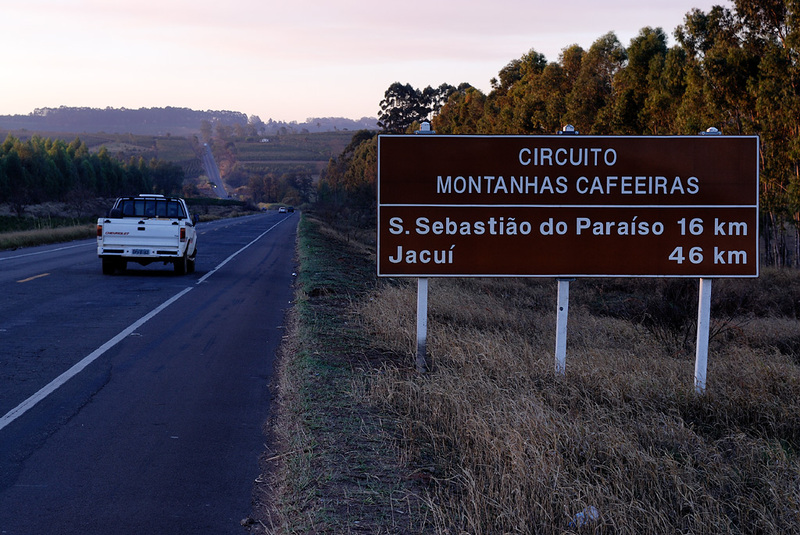 I had also visited another Coffee-Fazendas, as well as the Coffee Cooperative Cooparaíso in São Sebastião do Paraíso, one of the biggest coffee cooperatives in Brazil, right in the center of the heart of the ‘coffee mountains’ in the state of Minas Gerais. 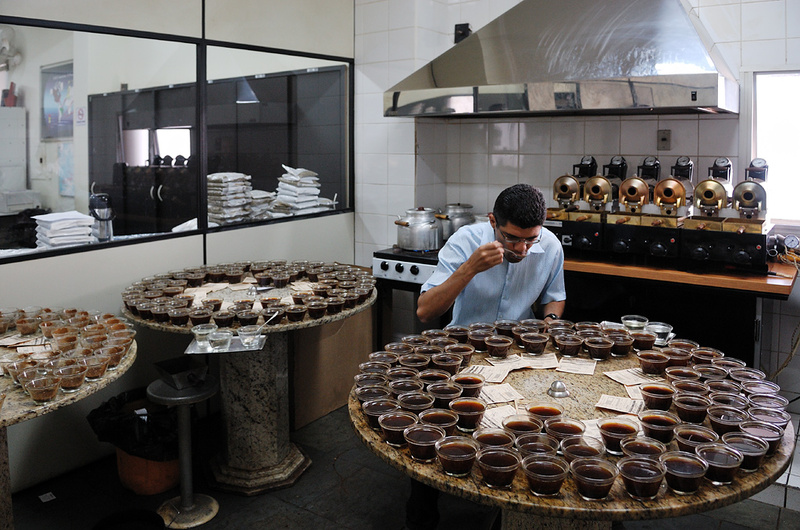 There Daniel Pereira is Head of the Department ‘Coffee Classification’ (‘classificação de café’). His work involves, among other things, coffee tasting. This is very impressive, but not as easy and comfortable, as it seems – we will see why. The preparation for this is all the more tempting: a warm aroma of freshly ground and brewed coffee wafts continuously and irresistibly through the office rooms. At the Cooparaíso he works with new roast samples of the German company Hotfilter from Nordhorn; “There is nothing like this world over”, says Daniel Pereira, proud to report to his guest something similarly positive about his guest’s country. However, till the coffee samples are delivered at his desk for classification and tasting, the work path is long and hard. 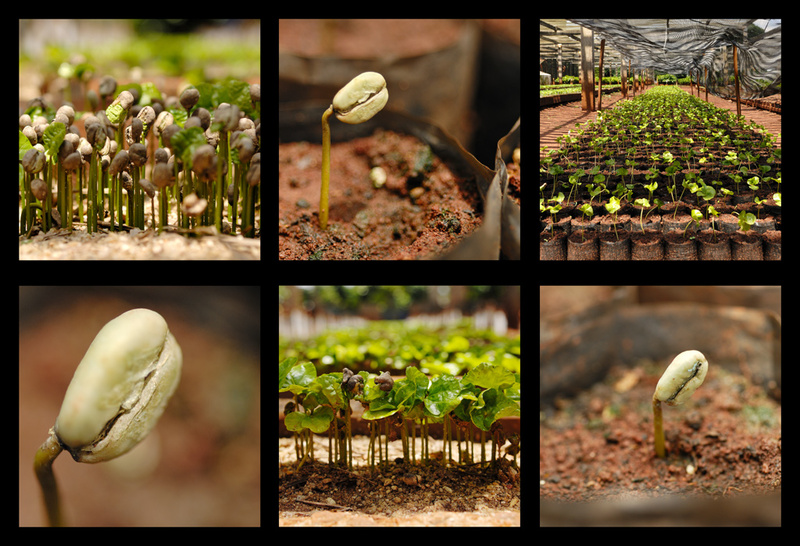 The life of a Brazilian coffee tree begins normally as a seedling in a nursery, where together with many other chosen coffee seeds, it is grown in half shadow at a uniform temperature, best between 25°-30°C, and constant unvarying humidity. A seedling in Portuguese is called, according to its current condition, match stick ('palito de fósforo') or panther ear ('orelha de onça'). 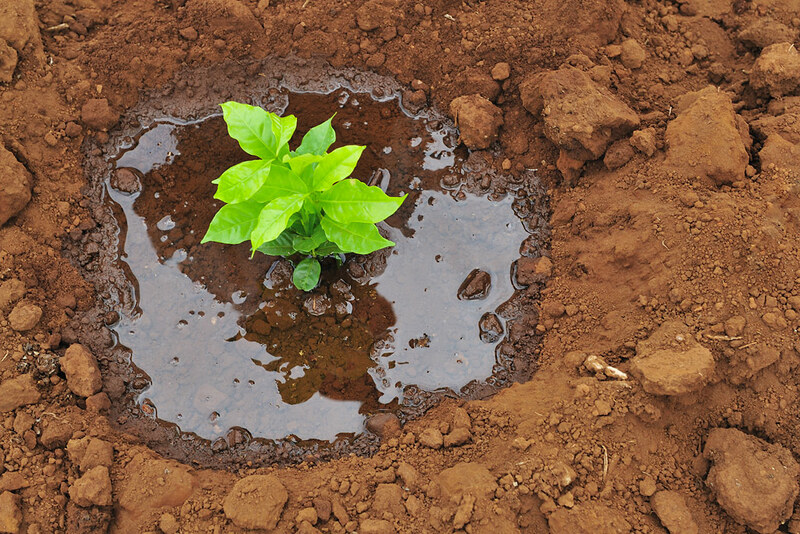 After about 6-8 weeks, the little plant is seen sprouting out of the earth. The seeds provide the fine bent seedling, which sits under the earth, with the stem facing the end of the seed, powerful nutritive tissue. As soon as the leaves are strong enough, and ready to expand, they allow the outer shell to burst: its Panther ears! 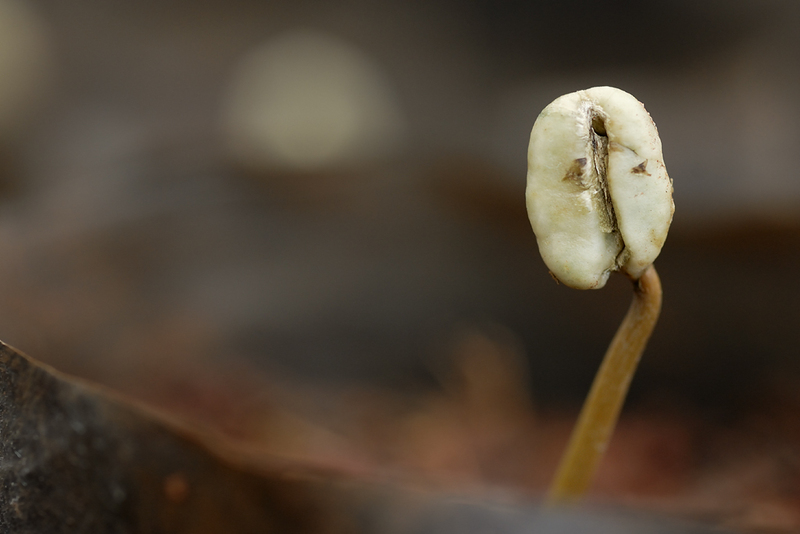 By this time it is about 5 cm tall, and approximately 6-8 months later, when it is has reached a height of 30-40 cm, then it is already a coffee sapling (‘muda de café’) und ready to move into the coffee plantation. 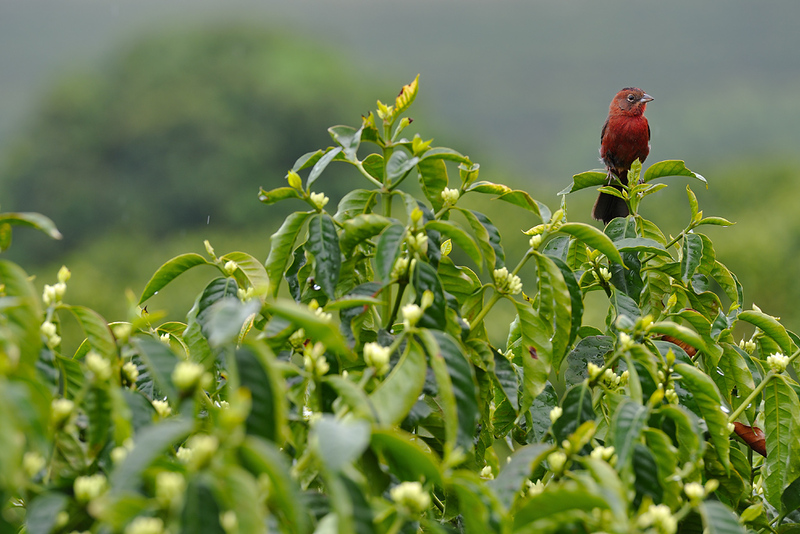 That the small coffee tree lives in Brazil is not natural, because it is not native to the land. 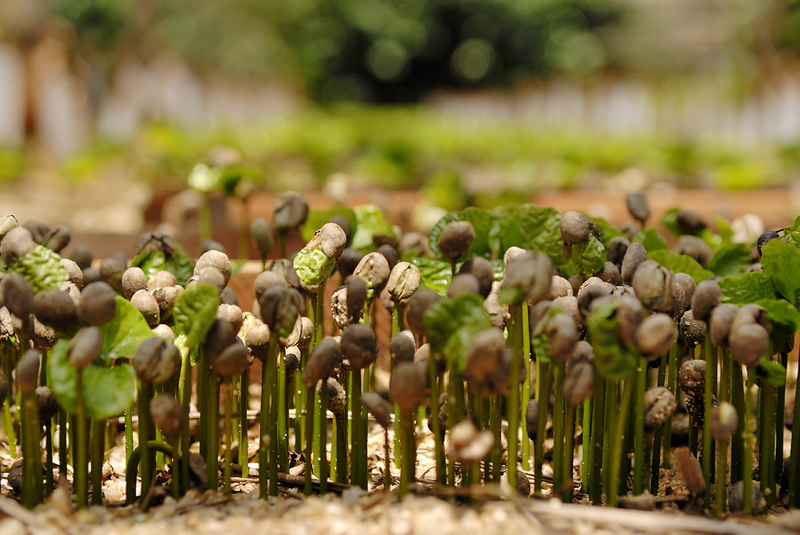 The first coffee plant reached Brazil in 1727; that is an assured finding. It is also certain that this was facilitated by the young Sargent, Francisco de Melo Palheta. The Governor of the state of Pará instructed him to bring with him a coffee plant from his visit to the Governor M. d'Orvilliers in French Guiana, since Brazil possessed neither the plant nor the seed for the coffee plant. All other further details of this story revolve around speculation and legend. The Governor of French Guiana, M. d’Orvilliers in French Guiana was possibly strictly prohibited by his King to comply with this Brazilian wish. Now, however, it so happened that Madame d’Orvilliers, the wife of the Governor of French Guiana herself, could not for long resist the advances of the young formidable Francisco de Melo. When he was returning to Brazil, the besotted lady sent him a bouquet of flowers; he found hidden inside a few of the long-yearned seeds. From then on Brazil became the area for coffee cultivation, and later out of these seeds the mighty rule of Brazilian coffee was born. A suitable episode in the history of a seductive bean. And perhaps the model for the first Brazilian Telenovela (television drama serial)? Before the workers of the coffee plantation plant our little saplings, the coffee famer Paulo prepares the new coffee field. 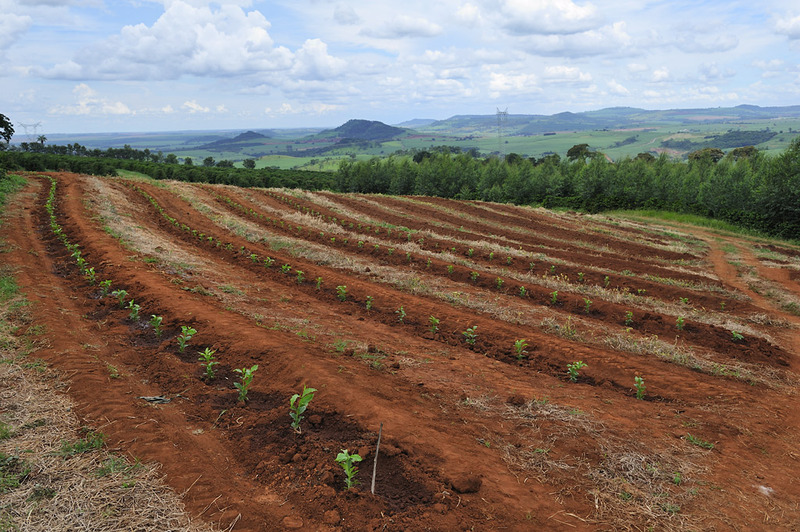 He ploughs the field and then decides the planting course for the new coffee trees, which he has adjusted to suit geological conditions. 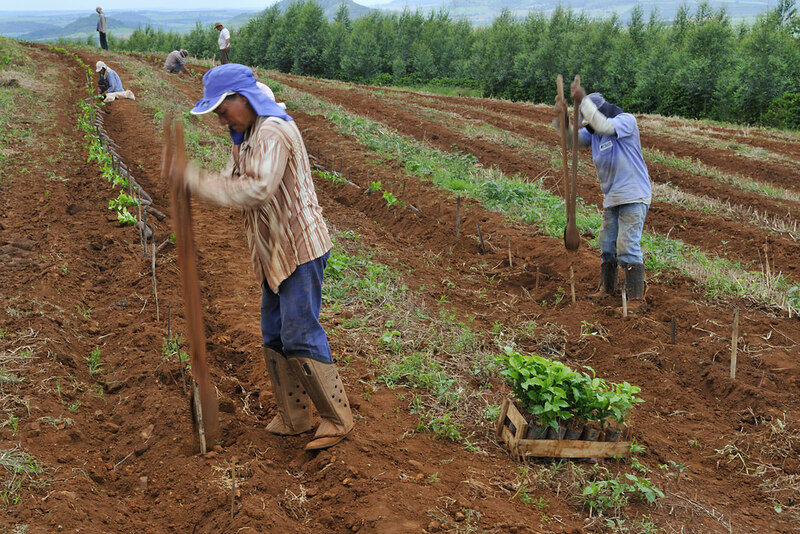 In order to prevent the rainwater from draining off too quickly after the particularly heavy tropical rainfalls in the rainy season, as well as to avert erosion, he lays out the lines always along the slopes. 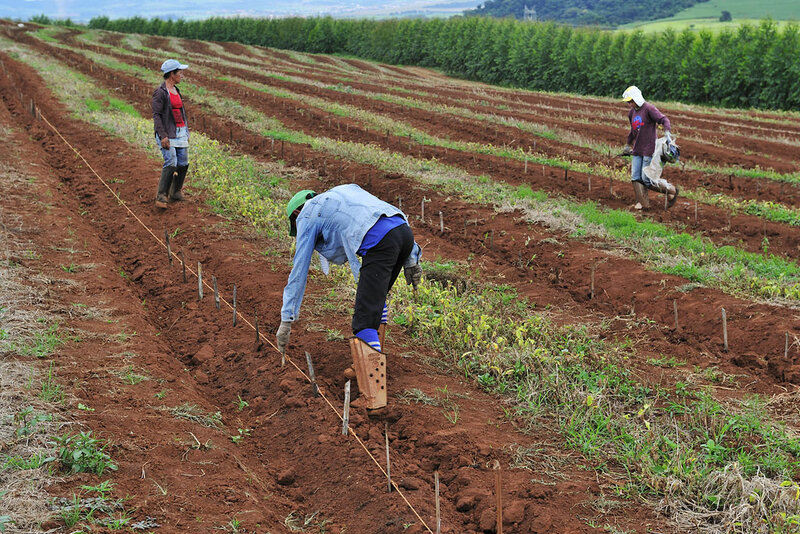 The next step in the preparation of the new field for the saplings is for three of the female workers to specify the distances between the newly planted trees. This is achieved with the help of a pre-knotted string, which specifies the distance, and also with hundreds of small bamboo shoots, which will mark the later planting points. 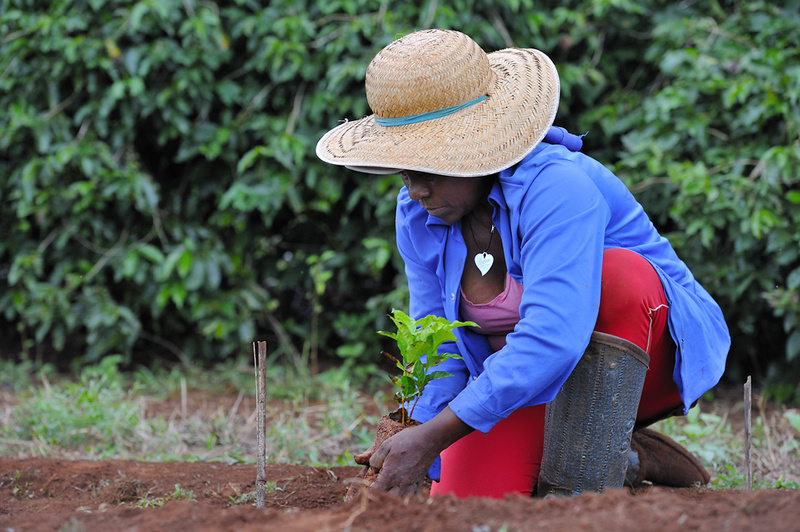 Earlier the coffee planters planted the trees at a distance of about 2 meters and with it obtained a concentration of 1000-3000 trees per hectare depending on the distance of the rows of trees (which were between 3-5 meters). With modern findings and ‘compression methods’ ('método de adensamento') the coffee planter achieves today, with a distance of only 80 cm, 7000-8000 trees per hectare! The newest method is even called ‘superadensamento’ and the trees are placed at a distance of only 50 cm. Experiments have shown that the trees make up for the lack of space between tress by growing outwards, and the amount of fruits per tree on an average remains the same. First, two or three persons dig holes with a special forceps-spade, while another places the saplings in the holes. Then the grafters like Ivone remove the plastic foil and plant the saplings in the earth. Subsequently, two of the workers irrigate these with water, which beforehand has been treated with a special gel. “With it the water turns viscous, it does not trickle down into the earth so quickly and has a longer irrigable effect”, explains Paulo to me. At the end, the small team levels off the heaps of earth around the seeds and clears the area. pot. A sign of hospitality and acceptance. 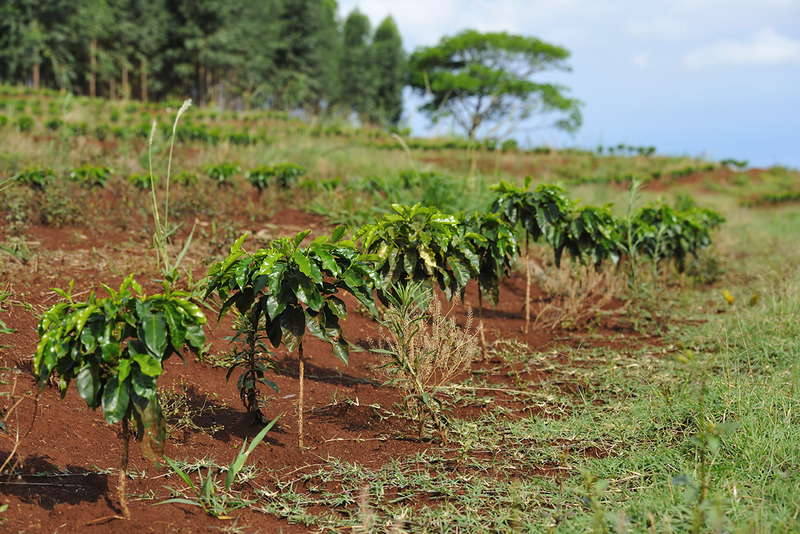 At the age of three, the young coffee trees bear fruit for the first time; they can only be harvested by hand, because they are still too sensitive for machines. The field is however, already designed for a machine harvest for the future. That means the distance between the rows is 3 meters and the slope is not too steep. 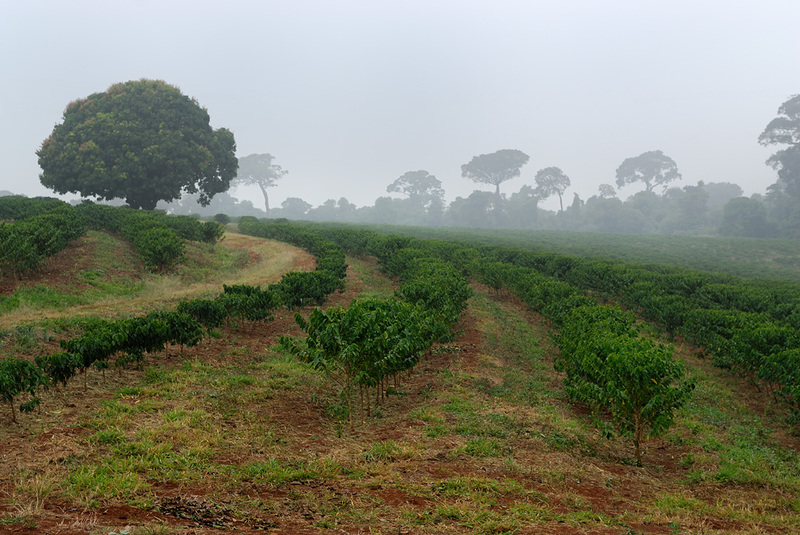 The coffee trees require a balanced, mild weather, without extremes in temperature: without intense heat – Arabica 15°-24°C, Robusta 18°-29°C – but for that lots of rain: 1500 to 2000 mm in a year! As the trees like the humidity, the morning mist is optimal for them. One thing should however, never be present: Frost! Frost is instantly fatal for both types of coffee trees. 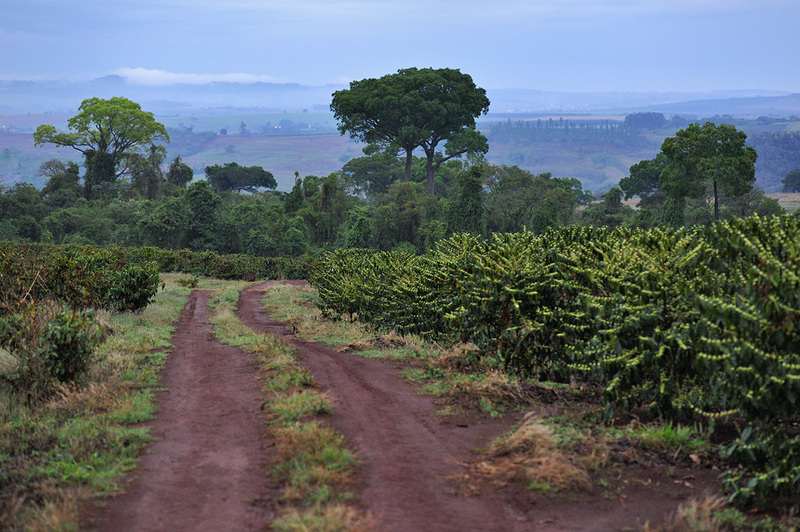 Even a single night of frost during the bloom can destroy the entire harvest and result in irreversible damages for the coffee plantation. The coffee growing regions are located in accordance to the requirements, between the tropics, for Arabica Coffee at altitudes of about 600 meters upwards. 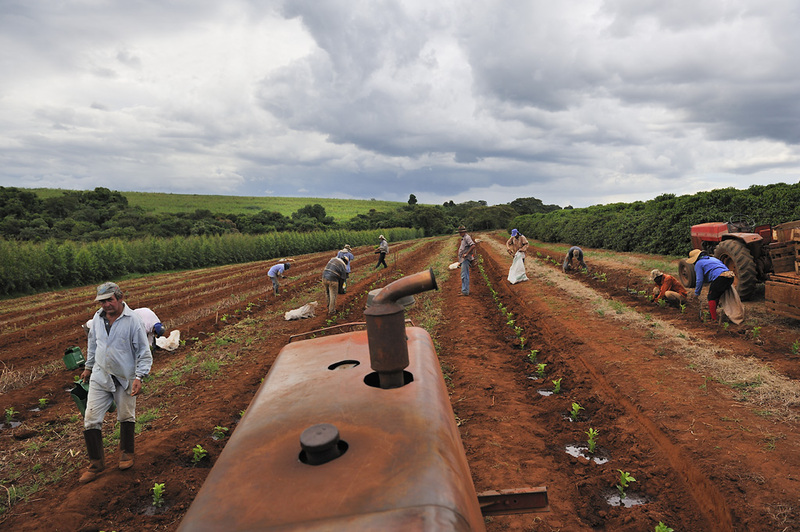 More than 90% of the Brazilian coffee is grown in the states of Paraná, Espírito Santo, Minas Gerais und São Paulo. 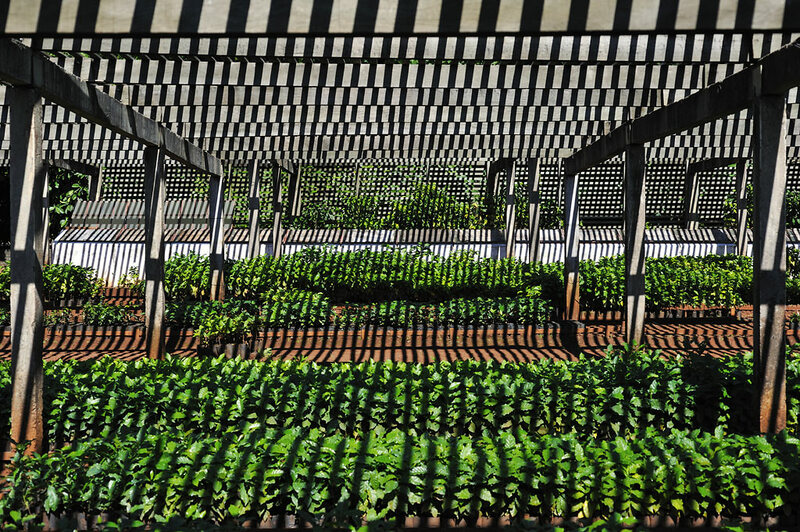 The coffee farmers in the state of São Paulo work almost exclusively with Arabica coffee, the Fazenda Boa Vista works with the high quality Arabica varieties Mundo Novo and Catuaí Vermelho, that optimally thrive there. 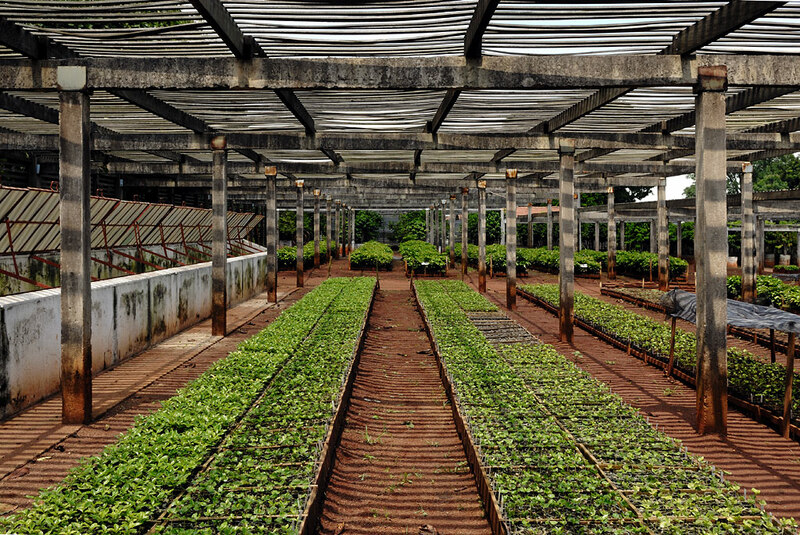 Other Arabica varieties that are grown in Brazil are for example Typica, Bourbon or Caturra. The rainy season begins with the first rainfall in September. This is the signal for the short duration of coffee blossom. The flowering period is divided in an early, main and late flowering period. In the early flowering period about end September early October the flowers are formed, but still closed. In this stage the flowers are still greenish white. After the first strong tropical rainfall descends and the rainwater has permeated about 20-30 cm into the ground, the buds start to open with the next longer period of sunshine. The snow-white flowers blossom for only one day: They rise with the first rays of the morning sunshine, by sunset they are brown and withered. The flowers that have not bloomed on the first day, bloom the day after; that is after two days, the whole white magic is gone, once again. As the fields do not blossom all at the same time, the flowering period extends altogether over 3-4 weeks. The Arabica Coffee has 44 chromosomes, in contrast to the Robusta Coffee, which has 22 chromosomes. If one were to ponder this, it is quite crazy, as a human being also has 46 chromosomes. This makes the Arabica plant more complex as compared to the Canephora plant (Robusta) and even the aroma subtler. Owing to this characteristic the flowers of the Arabica Coffee do not require insects to pollinate: the plant can pollinate itself! 2.5 million pollens are sufficient to pollinate the 30,000 – 40,000 flowers per tree. 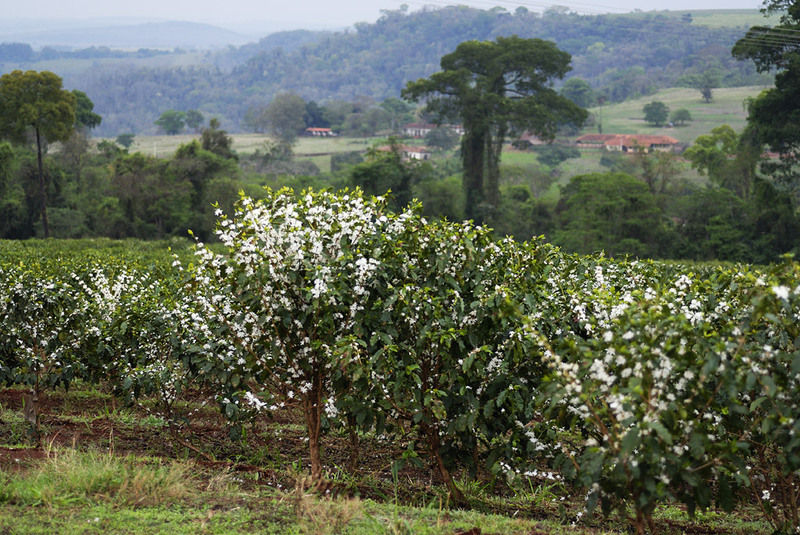 A large part of the Arabica coffee flowers are also pollinated by wind. For that there has to be very little rain by day and a light wind, then the pollination takes place by itself. 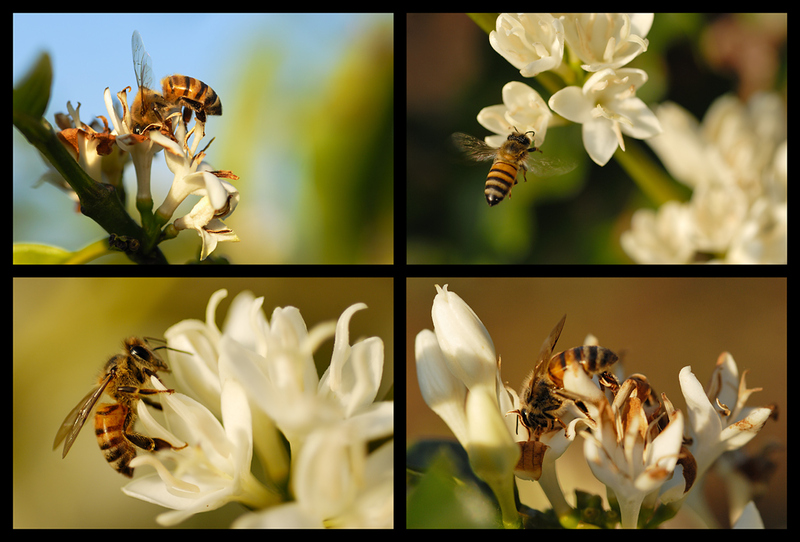 However, additionally for the bees to pollinate the flowers, the coffee planters and bee-keepers work collaboratively in a win-win situation. 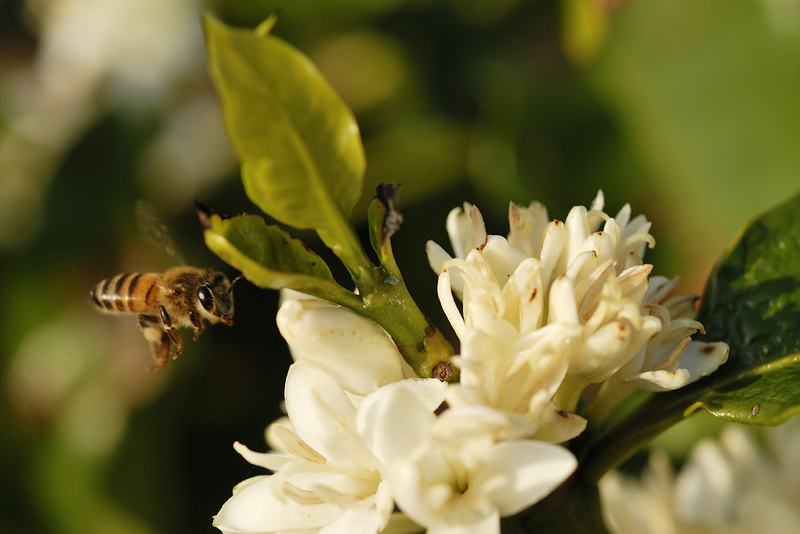 Before the flowering of the coffee, the bee colonies settle close to the coffee fields. On one side, this increases the production of the coffee trees, and on the other side gives the bee keepers a creamy-caramelized, delicious-coffee-honey, which tastes fruity and boasts a mild fragrance of jasmine, explains Paulo. By sunrise the coffee bees are already hard at work. It is a delightful humming and buzzing, an untiring back and forth, a true "macro spectacle". It was truly joyous to cavort with the camera between these small, bustling honey producers that were only busy with themselves and their pollen gathering. 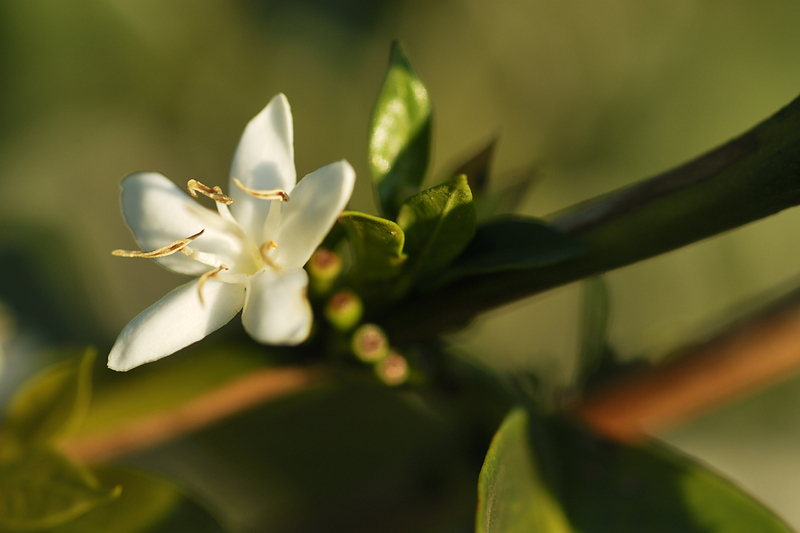 A blossoming coffee plantation is very beautiful and emanates by morning a strong and pleasant sweet jasmine fragrance.